You can use the 'Filter' tab to create a customized list of events and also choose the order in which they are displayed. Your list of events will be displayed in the Filter tab, for you to navigate easily. Select the Filter tab. It is next to the Navigator tab, as shown in the picture below. Choose either the search button or one of the specific sports. This will open the filter / search form as shown below. 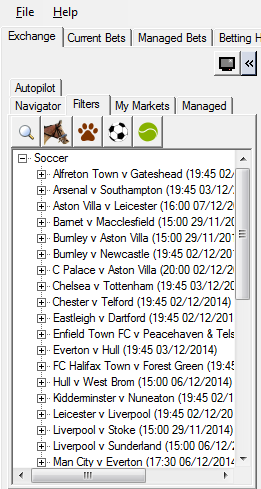 Country Code - click the binoculars to display a full list of country code and tick them. After choosing criteria, click the preview button (magnifying glass). Any events matching your criteria will now be displayed in the panel to the right. After loading the events into the preview panel, you can sort them by clicking on a column title. If you click on the 'OpenDate' column title, the events will be sorted by start time. Any events with the same start time will be additionally sorted by name. This is not available for horse racing or dogs, which are always chronological. After previewing the results, you can click the button to confirm the list and close the search form. The events will now be loaded into the Filter tab. 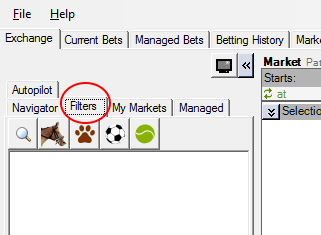 Go to the filter tab and expand the events to browse the markets within them. You can click on the name of a market to open it.